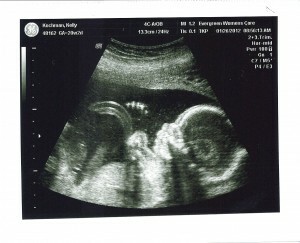 20 Weeks – It’s a boy! Video of the ultrasound: http://www.youtube.com/watch?v=CcvK6R22Pcw Pictures from the ultrasound: http://kochman.smugmug.com/Other/20-Week-Ultrasound What an exciting week it has been. We had the long anticpated 20 week ultrasound when we found out our bundle of joy is a boy. We didn’t have a gender preference and were thrilled to see that everything is looking healthy. It was also odd to think this could be our second and last ultrasound until we see the little guy in person if everything continues to look good. Rob was able to feel the little guy move this week for the first time which has been so much fun to share with him. Let the naming game begin! If you have suggestions please leave us a comment. We would love to hear them.